Yesterday, as we (my church family) were praying for churches that we’re working towards establishing in El Salvador and Ghana, I began thinking about the impoverished communities where these churches will be built. As I prayed, in my spirit I was reminded of 2 Corinthians 8:2 which states, “They are being tested by many troubles, and they are very poor. But they are also filled with abundant joy, which has overflowed in rich generosity.” Of course, in context, Paul was writing this to the church at Corinth, regarding the churches in Macedonia, who, though having very little, gave freely and abundantly to the believers in Jerusalem, who had even less. But I was reminded yesterday, that the believers in other nations and cities who are lacking basic every day needs, are in the same boat! They may have very little in monetary and dietary value, yet they are rich in faith and joy. How is that possible? Well, let’s recall the Israelites in the desert, after God rescued them from Egypt. Did God not provide for their every physical need on a daily basis? Just as the Israelites were forced to a position of complete reliance on God for daily sustenance—manna, quail, water, and even clothing—these churches in nations with very little, recognize that God is the giver and sustainer of life! They have faith in His faithfulness and ability to provide for their every need, even though their current situation tells them otherwise. I believe, in America, faith like this is difficult to obtain because we have so much! Having much isn’t a bad thing, but when we come to rely more on the things that we have, rather than the Giver who provides them, our faith and relationship with Christ are impacted negatively. Therefore, we shouldn’t hold so tightly to the things that God has so richly blessed us with, but always remain in a position of obedience, thanksgiving, joy and compassion that moves us to help our brothers and sisters in need. Lastly, a few weeks ago, as I was helping out in the kid’s church on a Sunday morning, the speaker described a pitcher pouring water into a cup and the cup overflowing, as an example of Psalm 23:5: “You prepare a table before me in the presence of my enemies. 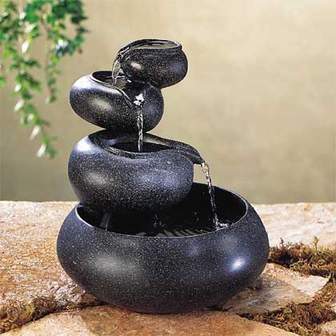 You anoint my head with oil; my cup overflows.” And as he spoke on this, I immediately pictured one of those fountains in my head, in which, a pitcher pours water into one cup, which, in turn, pours water into another cup, and then into another, and so forth. I remembered that God blesses all His children—whether financially, spiritually, with knowledge, or other gifts—but we aren’t to keep the gifts to ourselves! We’re to allow it to pour forth into the lives of others, so that they, in turn, can do the same. Therefore, let us remain in a position of submission to God, seeking His face daily, and allowing Him to continually pour into and bless us, so that we can pour into and bless those around us. Let our faith be not in the things we have, but in the One who gives them; and may our hearts be full of joy and faith, knowing that God is faithful and just (Psalm 111:7; 1 John 1:9), trusting that He cares for us (Matthew 10:29-31), and having full confidence that He has and will continue to provide for us, strengthen, and protect us (Psalm 31:22-24; Isaiah 40:29-31; Romans 5:17-18). In Him we place our hope!